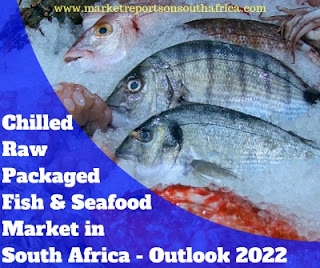 Market Reports on South Africa Provides the Trending Market Research Report on “Chilled Raw Packaged Fish & Seafood - Processed (Fish & Seafood) Market in South Africa - Outlook to 2022: Market Size, Growth and Forecast Analytics” under Food and Beverage category. The report offers a collection of South Africa market Trends, South Africa market analysis, South Africa business trends, and South Africa market size and growth. Chilled Raw Packaged Fish & Seafood - Processed (Fish & Seafood) Market in South Africa - Outlook to 2022: Market Size, Growth and Forecast Analytics is a broad level market review of Chilled Raw Packaged Fish & Seafood - Processed market in South Africa. Chilled Raw Packaged Fish & Seafood - Processed market in South Africa registered a positive compound annual growth rate (CAGR) of 5.07% during the period 2012 to 2017 with a sales value of ZAR 2,230.16 Million in 2017, an increase of 4.42% over 2016. The market achieved its strongest performance in 2016, when it grew by 5.87% over its previous year and its weakest performance in 2017, when it increased by 4.42% over 2016. The research handbook acts as an essential tool for companies active or planning to venture in to South Africa's Chilled Raw Packaged Fish & Seafood - Processed (Fish & Seafood) market. The comprehensive statistics within the research handbook provides insight into the operating environment of the market and also ensures right business decision making based on historical trends and industry model based forecasting.